As you may have heard, NOAA/NGS will be replacing NAD83 and NAVD88, our current horizontal and vertical reference frames or datums, in 2022. They have lots of information on their site to help you with that, but I want to talk about what that means for data on the Digital Coast and you. If this post piques your interest in the coming changes, you’ll want to check out the Geospatial Summit in May 6-7, 2019 in Silver Spring, MD (there will be an option to attend virtually). A few things have happened since NAD83 and NAVD88 were set. First, while NAD83 was originally intended to have an origin at the center of the earth, we’ve gotten better information and know it is off by a couple meters. The new reference frame will rely primarily on Global Navigation Satellite Systems (GNSS), such as the Global Positioning System (GPS), and be aligned with other references frames such as ITRF. For the vertical, NAVD88 has been found to have a tilt of around a meter from Florida to Washington. I believe this was caused by small cumulative errors in leveling, but there are probably other reasons as well. The datum will use gravity measurements and remove that tilt. You can get some idea of what the change in elevation will be on the xGEOID18 Interactive Computation Page. For example, elevation values for Charleston, SC will be about 26 cm lower in the new reference frame than NAVD88, while Seattle, WA elevations will be 120 cm lower. Not only are we changing the reference frames, there is also a new definition for the state plane system. The new system will be called the State Plane Coordinate System of 2022 (SPCS2022). The states have an opportunity to weigh-in. Typically, they will have the same zone extents and the same projection type, but the parameters will be modified to minimize linear distortion (the difference between “grid” and “ground” distances or “scale error”) at the topographic surface. Current State Plane (SPCS83) minimizes scale error at the ellipsoid surface. This will be the source of most of the change in coordinate values, although the false northings and/or eastings may also be modified to ensure that SPCS2022 coordinates change by at least 10,000 meters to make it obvious you’re in SPCS2022 and not SPCS83. For more information on the process of creating the new zones, check out NGS’s 2022 SPCS policy changes and some of the recent NGS webinars. As summarized for me by one of the friendly NGS advisors, the SPC2022 system will have up to three layers per state, two of which will have statewide coverage. 1. Statewide layer, facilitates state imagery and lidar type collections. 2. Statewide multizone layer, like current Virginia North and South zones or, statewide Low Distortion projections, such as proposed in Iowa and Oregon. The LDPs would displace the current SPC zones. 3. Discontinuous non-overlapping multizone layers. Alaska and others have need for projection areas in specific spots, specific to populations or activities. 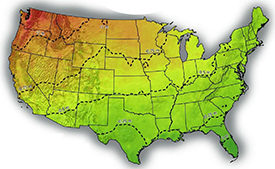 All states will have a statewide zone layer at a minimum. The creation of the other layers will depend in part on what individual states decide is needed. Few states are expected to have all three layers. All these changes will have an impact on the data you download from the Digital Coast. For custom downloads through the Data Access Viewer, we’ll be adding the new reference frames as a choice. They are likely to become the default choice, but the old frames will still be an option. This will involve adding the reference frame translation software into the back-end processing and timing will depend upon what NGS makes available for those translations. For the data staged on the web site for bulk download, we haven’t determined the best course of action yet. For raster data, we’ll probably leave it as it in it’s native system. For the lidar point clouds, I expect we’ll slowly translate the data to the new reference frames, making both versions available. For those that have dealt with the NAD27 to NAD83 switch, this is probably obvious. It means you’ll need to pay more attention to which reference frame your data is in and ensure the georeferencing is encoded properly. I expect software will be able to detect the frames correctly and handle the transformations. That part should be much better than the last switch, but you may want to be careful with your assumptions about what the software is doing. For those working in the vertical and interested in things like sea level change, it will be critical to recognize which reference frame your data is in. The changes won’t be big enough to make it immediately obvious, like they will be for state plane coordinates, but they are big enough to make a significant impact when deciding how high your house needs to be to mitigate flood risk.